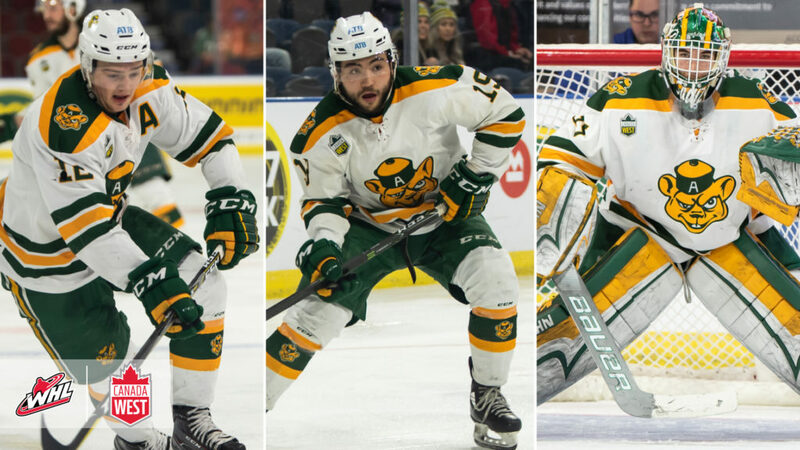 Each week during the Canada West men’s hockey season, CW and the WHL honour three WHL Grads now playing in CW. 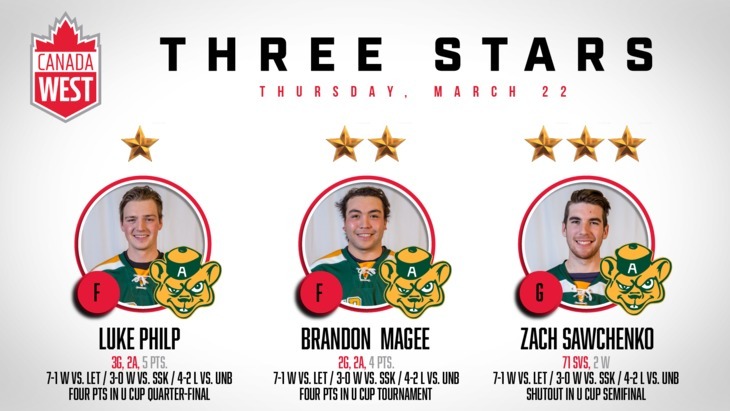 Here are the CW-WHL three stars for the weekend of March 14-17 at the University Cup in Lethbridge. Canada West Player of the Year Luke Philp made an impact over the weekend at the University Cup while he was on the ice for the Alberta Golden Bears. 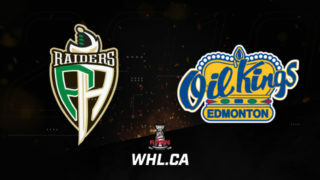 The former Red Deer Rebel opened the tourney with a pair of goals and assists in the quarter-finals against the host Lethbridge Pronghorns. Philp followed up that performance with a goal in Alberta’s semifinal win over the Saskatchewan Huskies. After his strong start to the tournament, Philp couldn’t leave the impact he wanted on the final against the UNB Reds, as the third-year forward suffered a lower body injury midway through the first period, and didn’t return in UNB’s 4-2 victory. 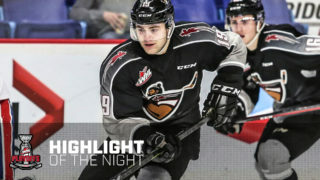 On Tuesday, March 19, Philp signed an entry-level contract with the Calgary Flames, allowing him to continue his hockey development within his home province. After opening the tourney with a goal and an assist versus Lethbridge, third-year forward Brandon Magee did his best to help Alberta defend their U SPORTS title in the national final. Magee starred in both Alberta goals Sunday against the UNB Reds in the final, assisting on Steven Owre’s game-opening goal in the first, before scoring his own early in the third period. After a light workload in the tournament opener Thursday, Alberta goalie Zach Sawchenko kept Alberta’s title defence alive Saturday with another shutout of the Saskatchewan Huskies. 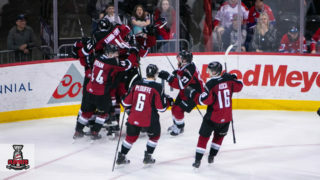 The former Moose Jaw Warrior blanked the Huskies the last two games of the CW Final to lift Alberta to the conference title just two weeks ago. The second-year netminder followed that up with another shutout of Saskatchewan, this time in the national semifinal, stopping all 33 shots he faced. Sawchenko and the Bears came up just short in the national final on Sunday, as UNB got four goals past the CW second-team all-star, ending Alberta’s run atop U SPORTS men’s hockey. 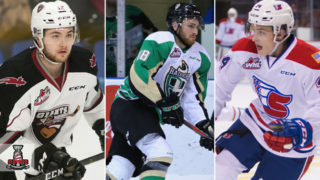 Each season more than 100 WHL Graduates use their WHL Scholarship with one of eight Canada West men’s hockey programs. 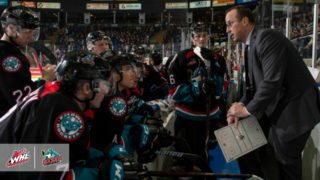 Through CW’s continued partnership with the WHL, players are given the opportunity to pursue high level hockey and a degree simultaneously, allowing student-athletes to achieve their athletic and academic goals. 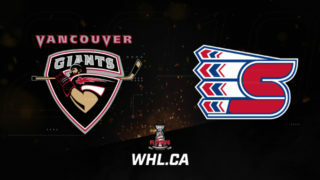 You can watch every CW men’s hockey game all season long by visiting CanadaWest.TV. For more information on CW men’s hockey, click here.